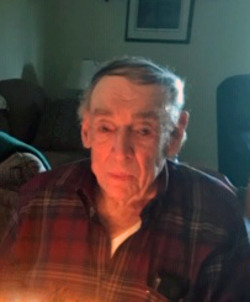 Richard Stanley Moore, age 91 of Virginia died Monday, January 28, 2019 in Essentia Health – Virginia. He was born July 7, 1927 in Virginia the son of Richard and Fanny (Wainionpaa) Moore, was a graduate of Virginia High School, Class of 1945, and served in the United States Army in WWII. Richard married Mary Bauch on May 13, 1961 in Virginia and was a longtime telephone equipment man for Bell Telephone prior to co-owning Lackner & Moore Telephone Repair. He was a member of the Telephone Pioneer’s Club, enjoyed fishing, liked working puzzles, was an avid reader, an excellent bowler; was a jack-of-all-trades who was always puttering around, and could repair almost anything. Richard is survived by his wife of 57 years: Mary Moore; children: Lisa (Todd) Smith of Cokato, Lori Rime of Rochester and Michael Moore of Virginia; grandchildren: Brett Smith, Jacob Smith, Paul Rime, Patrick Rime, Elizabeth Rime, Abby Moore and Daniel Moore; extended family and friends. He was preceded in death by his parents; and sisters: Kay Dalton, Elsa Morris and Marie Hejda. The Memorial Service will be held on Saturday, February 2, 2019 at 10:00 a.m. in the Bauman-Cron Funeral Home Chapel. Reverend Father Brandon Moravitz will officiate. A Gathering time for family and friends will begin one hour prior to the service. Memorials are the preferred way to honor Richard’s memory and may be directed to the Alzheimer’s Association, 225 N. Michigan Ave., Fl. 17, Chicago, IL 60601. Family services provided by Bauman-Cron, A Bauman Family Funeral Home in Virginia. To share condolences online, please see: www.baumanfuneralhome.com.